1. How do I write a basic program with a window? This is an easy way of learning to program windows in a few simple steps. The new program consists of two parts, the code (commands of the program), and the window (or dialog) that will appear on the screen. This is the first step, and can be done automatically. Start the Ubercode Developer Environment, click Close in the startup wizard, then choose File - New - Program from the main menu. Click OK to accept the defaults, or choose a different directory and name if you want. Leave the program type as "1-Main Window". After clicking OK, the new program and its dialog are created, and the code window, dialog editor and program window automatically open. The code processes events in the dialog when it runs, the dialog editor defines the layout of the dialog, and the program window shows all the files used in the program. If you look at the code window, you'll notice a function called Main - this function processes all the events from the dialog of the same name. This code says that whenever Pushbutton1 is pressed, the dialog is unloaded (closed). Change the Caption property to a short message, for example type in My first program. After typing the text, click OK to close the Label Properties. Change the Caption property to Close Me and the Default property to 1 (both shown above). Then click OK to close the Pushbutton properties. Also you can add an Icon object. In the toolbox, click the Icon object button, located to the left of the Label. This drops the Icon onto the dialog. Drag it where you want, then right- click the object to set the Icon properties. In the Icon properties, you can choose the picture. It must be an icon file. Click the small button next to the Picture entry field, and browse until you find an interesting icon. There are hundreds of icons in the \Program files \Ubercode \icons directory. Click OK after choosing the icon. If you wanted to modify the properties of the dialog itself, right- click anywhere on the dialog background (except on a control object). This brings up the dialog properties, which include such things as the dialog caption, whether the dialog is resizable, and the dialog name etc. If you do this, don't change the name from main since the name must match the code. In this example, the dialog is called main and the code contains a function called main. Function main processes button clicks and other events from the dialog. Function main detects the COMMAND_EVENT (triggered whenever a Pushbutton is pressed) and uses it to unload the dialog. Each dialog always has a function of the same name. Although this example only has one dialog, programs are allowed any number of dialogs. Each dialog must have its own function. The name main is special, and it means the function and its window are called first when the program starts running. All programs must have a function called main, which is where the program starts. That's it! You have successfully written a Windows program that could run under any version of Windows. 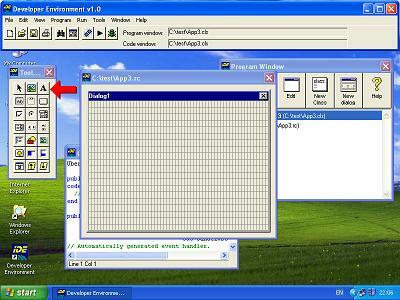 The window above is part of the EXE file, and it can outside the Developer Environment if wanted. Press the "Close me" button to end the program. The Close button triggers the Command event, which unloads the dialog. The program will then end because it has no windows left. 2. What are dialogs, forms, modal and modeless windows? The reason for the different names is historical. C/C++ programmers refer to them as dialogs, the Windows documentation uses dialog box and Visual Basic (for reasons only known to Microsoft) uses form. When you're learning Windows programming, you can use the word dialog instead of form, or vice versa. Internally to the Windows operating system, they are the same - they are all WND structures referenced by a HWND. A modal dialog (or window or dialog box or form) refers to a dialog that locks out all other dialogs in the same program. The other dialogs can only be used when the modal dialog is hidden or closed. Modal dialogs are used when a program requires some information or requires to finish a task before continuing. A modeless dialog (or window or dialog box or form) refers to a dialog that does not lock out other dialogs. This is important when multiple dialogs are shown by a program. If the dialogs are modeless, you can switch between them by clicking them with the mouse. This is useful when dialogs are used for independent pieces of information. Modal and modeless dialogs only take effect within a single program. A modal dialog has no effect whatsoever on dialogs in a different program. 3. How do I create a dialog? Start the Developer Environment by double clicking its icon. Choose the File - New - Program command from the menu. A properties dialog will appear that allows you to choose the program details. Check the program is being created in the directory you want. You can type in a different directory or press the small button next to the entry field. Press OK when you've selected the directory. Several new windows will appear. There is a dialog editor (covered with a grid), a code editor containing some text, and a program window which shows all the files in the program. Click on the dialog editor to activate it. Add some control objects by pressing the buttons on the Toolbox. To change the properties of an object, right-click it with the mouse to bring up the properties dialog. After changing the properties, click OK to close the Properties window and save the changes. You may want to look at the code that processes the events in the dialog. Double-click the dialog editor background (not on a control) to locate the function that handles the window events. Note the function name "Main" is the same as the dialog name. In this example, we don't need any special processing for the window. Therefore the automatically generated code is OK and you don't have to change it. Now you have to run the program. Click the Run button which saves, compiles and runs the program. Wait a few moments, then the dialog you designed will appear on the screen. Now it's running as a real Windows program. 4. How do I create a modeless dialog? To paste the code, first select it in the browser window using the mouse. Make sure you've selected all the code, without selecting any of the text nearby. It should turn a nice dark blue color after being selected. Copy the code to the Windows clipboard (Ctrl+C). Go back to the Developer Environment, and paste the clipboard text (Ctrl+V). Save it as a "New Program". Press OK to confirm the file names in the "Save" dialogs. Click the Run button which compiles and runs the program. Wait a few moments, then you should see both dialogs appear. The dialogs are modeless therefore you can click on either one. Close both the dialogs to finish the program. 5. How do I create a modal dialog? This explains how to write a program with a modal dialog. A modal dialog blocks out all other dialogs in the same program until it is closed or hidden. Modal dialogs are useful when a program requires information before continuing. For example the File - Open command as used in most programs is modal, because a file name is required before continuing. Take a look at the main class "wnd3.cls". It has window functions for the three dialogs. Each function responds to the pushbutton that closes the dialog. Also, function main has three calls to Show. The first two calls show Window1 and Window2 as modeless windows, because the value "0" is used. The third call shows Window3 as a modal window, because the value "1" is used. The third call to Show does not return until the modal window is closed. Now you have to run the program. Click the Run button which compiles and runs the program. Wait a few moments, then you should see the three dialogs. Only the modal dialog can be used, and the other two do not accept input. Close the modal dialog. It will be unloaded and the modeless dialogs can now be used. Close the remaing dialogs to finish the program. 6. How do I set the title (caption) in a window? Use the Caption property. This can be initially set at design time, and it can be changed at run time using SetCaption. 7. How do I center a dialog box on the screen? Use the dialog's Alignment property at design time and set Alignment=Center. You can also center the dialog at run time by calculating the screen size and the dialog size, and using the Position property to place the dialog exactly where you want it. 8. How do I make a dialog window store its settings? Copy the RC file and the class to the clipboard, go into the IDE and use Edit-Paste (the IDE will save the files for you). Then run it.